Bizeek.com Reviews - Legit or Scam? Bizeek.com Reviews – Legit or Scam? Bizeek.com is home of the Automated Income work at home program, which claims that anyone can create their own profitable, at home business with only basic typing skills necessary. The opportunity being promoted at Bizeek.com claims to have quick and easy set up, with no technical skills required, and it allows you to set your own hours and be your own boss. 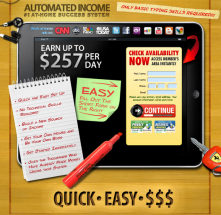 According to the Automated Income sales page, this program will teach you how to earn up to $257 a day from home, and all you need to get started is to pay a $4.79 access fee for instant access to their members’ training center. For this $4.79 access fee, you will get a 5 day trial to the members’ area, at the end of which you’ll be charged $39.95 and then a $14.95 monthly fee for continued unlimited access for a total of 12 months. Bizeek.com is selling a program for a total of $224.14, but they give you absolutely no information on what the business opportunity they are selling is. You will be your own boss and you need no technical skills, but they never say what you will actually be doing. If you cancel your membership during the 5 Day Trial phase, you will receive no further charges. In fact, you are allowed to cancel at any time during your membership and you will receive no further charges; however, no refunds will be given. The problem is that you should never have to give your credit card number to someone without understanding what you will be receiving in return. If you do, make sure you take advantage of the 5 Day Trial so if you are unhappy with the opportunity you can cancel before you incur any further charges.